The Wine Glass Hanging Rack is ideal for storing stemmed wine glasses or champagne flutes in any bar or restaurant. Storing your glasses in a hanging rack allows for quick and easy access to serve customers at a busy bar or fill a table with drinks at a restaurant. They can also be used at home too, it’s easy to knock over a stemmed wine glass when they’re stored in a cupboard, so using a glass hanging rack for storage can prevent this from happening. 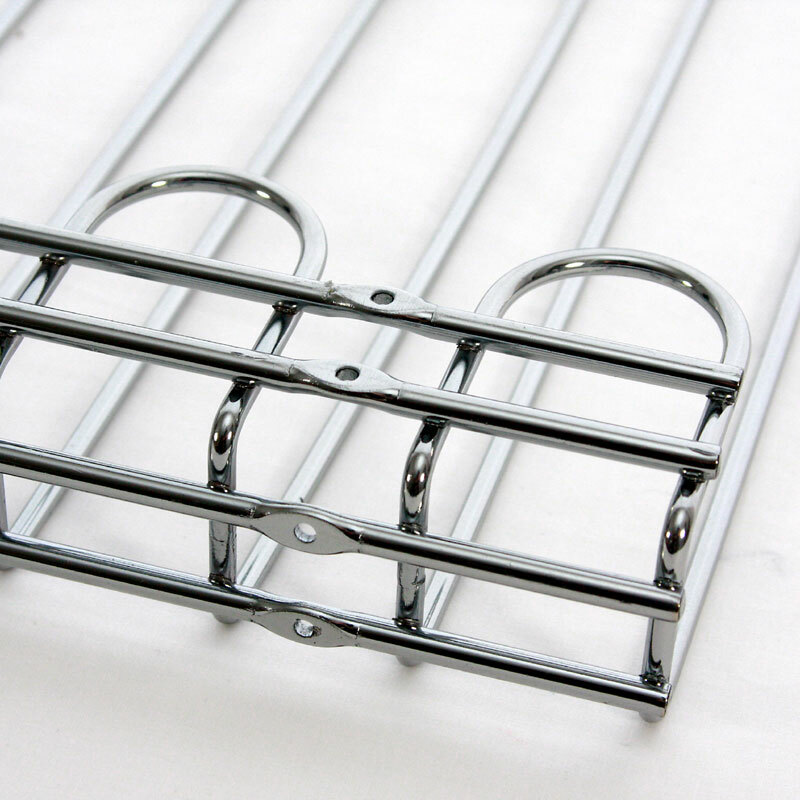 The glass hanging rack has two fitting options; it can be fixed either directly onto the wall, or underneath a shelf or cupboard. This rack can hold up to 24 Glasses (Luigi Bormioli 21.5cl ISO Style Wine Glasses) with 4 Glasses hanging in 6 sections. To store the maximum glass capacity, we recommend that glasses don't exceed 85mm (3 1/4") in diameter. Please Note: Glasses NOT included. This product has been redesigned. The metal is of a slightly thinner gauge and the item weighs 1.5KG. The wine glass hanging racks are incredibly easy to install! I like that we could use them with our own shelving as opposed to them being a unit which you have to use complete. Justin, Folk Café Bar Manchester. 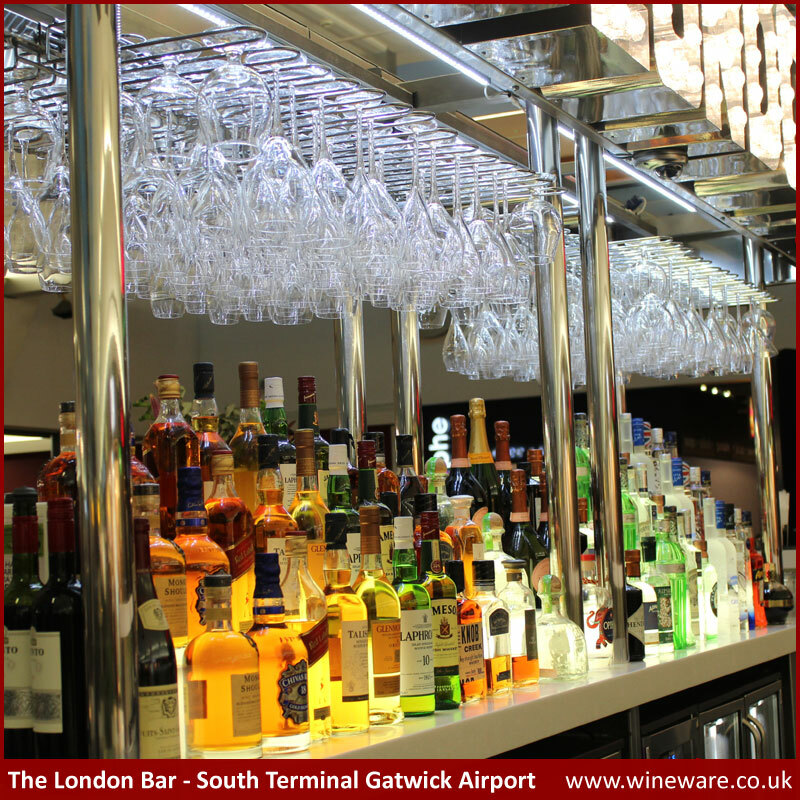 We find the wine glass hanging racks very useful to use in our restaurants. We use the glass racks in both the Wandsworth and Hoxton Restaurants. Antonio, Rossopomodoro Restaurant. Easy to install and very useful in my café! The wine glass hanging racks from Wineware were very easy to install and are very useful in my café. The glasses are always on hand, but out of the way of our work surface as well. Our customers comment on them quite a lot too! Sally, The Loft Café, Dorchester. Very good product would recomend and A1+ service. Just what I was hoping for. Now hanging on the wall of my holiday home , making life much easier to grab a glass for Vino! Seems very solid, hope it lasts without rusting in our damp atmosphere.